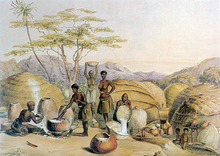 Beer-brewing at a Zulu umuzi, c. 1849. A homestead (Xhosa: umzi, Zulu: umuzi, Swati: umuti) in southern Africa is a cluster of several houses, typically occupied by a single extended family and often with an attached kraal. Such settlements are characteristic of Nguni-speaking peoples. A house within a homestead is known as an indlu, plural tindlu (Swati) or izindlu (Xhosa and Zulu). Wikimedia Commons has media related to umuZi.